Vintage school chairs hey? I sat on those bum-numbing things for the best part of the 80’s so I guess that makes me vintage as well. I love that I can now rely on you to sniff out the good java. Good coffe is a start but great coffee is a rare blessing! The setup and location for “Coffee tea & me” is great and just around the corner from where I live so high marks for convenience. Still that coffee needs some more work and maybe the Campos beans is the restriction? 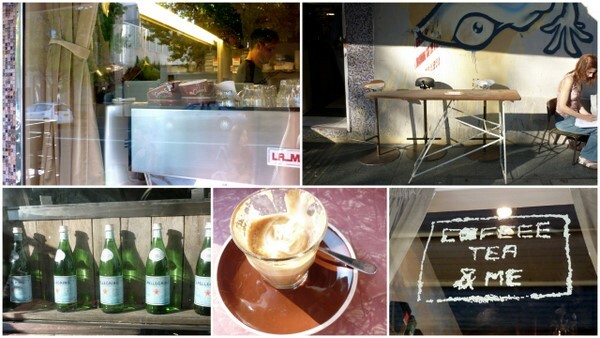 @ John – I’m pretty sure you can find your own coffee, judging by your recommendations so far ^_^. @ Fredrik – To me, Coffee Tea & Me is a solid coffee choice. I think the thing with Campos’ Superior blend is that it had a very syrupy sort of flavour profile (that’s the best way I can think to describe it) so if you’re not big on caramel flavours in your coffee, it won’t be for you. To be honest, it’s not my absolute favourite blend either. It’s a blend renowned for its consistent flavour though. You are right, there something almost chocolaty about it. Still I have now been back three times and I am slowly converting or the coffee is getting better? Either way works for me! Great little coffee shop, good tasting coffee BUT can get very busy and the barista rushes a bit resulting in luke warm coffee most of the time… needs a little more love and attention. I can’t agree or disagree with you there Dave as if somewhere is busy, by and large, I just don’t go there! I’ve only ever had coffee there before 8:30am on a weekday. At peak times they do seem busy.